Open source medical software gives healthcare organizations the flexibility and scalability in their health IT infrastructure. Over the past decade, health IT has evolved from an administrative mechanism to a clinical tool for improving the quality and efficiency of healthcare. Such cutting-edge technologies as the Internet of Things (IoT), cloud, big data and artificial intelligence have made their way into the healthcare industry, and the rapidly growing scope of information shared across the hospital departments has generated the need for accessible, affordable and widely supported software development tools and technologies. Open source medical software characterized by collaboration among developers and organizations with common interests, shared intellectual property, and a commitment to standards, is a potential solution to the challenges faced by healthcare organizations. Some experts emphasize that open source methodologies applied to healthcare could mean shorter routes to cures and faster diagnostics, resulting in more effective treatments. 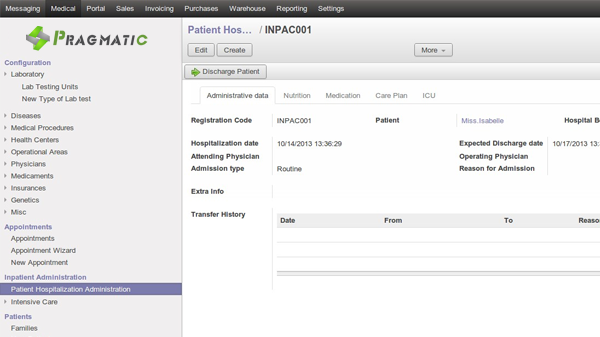 Open source medical software is clearly going to become deeply rooted in the industry. What distinguishes open source medical software from proprietary software is continuous enhancement. The entire open source medical software community can perform updates, investigate and fix bugs, advance the code, thus heightening its quality. Open source medical software is mostly well designed, stable, and reliable, which is, for obvious reasons, especially critical in the healthcare industry. Most open source medical software are based on the same technologies and paradigms, such as the IoT and big data, and even on the same core, which greatly facilitates their integration and joint operation. Moreover, many open source medical software are already integrated into ecosystems. With the growing diversity of medical equipment, wearables, and healthcare apps generating an overwhelming amount of data, medical device interoperability is a challenge healthcare organizations currently face. As a rule, Open source medical software have an open architecture and allow the integration of various products into a single system. Healthcare is an industry that must comply with a number of standards. Today, there are a large number of Open source medical software for various industry standards, such as Health Level 7, HIPAA etc. Many vendors offer commercial versions of open source medical software with enterprise support, and multiple versions of the same product are offered, each adapted to users’ specific needs. Importantly, the implementation and maintenance of open source medical software do not require much additional knowledge. Specialists who have mastered an open source medical software version can easily use commercial versions in their projects. Why Open Source and not Proprietary Medical Software? Open source medical software gives organizations the opportunity to implement new technology while still using legacy systems. Open source allows entities to work with other vendors so when the software is developed, it’s developed to work with everything. When organizations deploy open source medical software, it makes it much easier to share data and information and to integrate. Interoperability is all about open source, which is absolutely critical in healthcare. Open source medical software infrastructure can be compared to how doctors work together. Doctors collaborate with other doctors and specialists because having more people work on a problem increases the chances of finding a solution quicker. The same is true with open source medical software. There are multiple people working on a similar problem. It’s a natural fit into healthcare because clinicians understand the open source medical software development model. Organizations may implement proprietary software from different vendors. If a new proprietary solution is introduced into an IT infrastructure ecosystem it may not be compatible with the systems already in place, causing major interoperability issues between disparate systems. Entities cannot afford the time or money it takes to rip out their entire infrastructure and replace it. Open source medical software allows organizations to explore different technology options without needing to replace everything, while only investing in the open source medical software license and the developers they need. 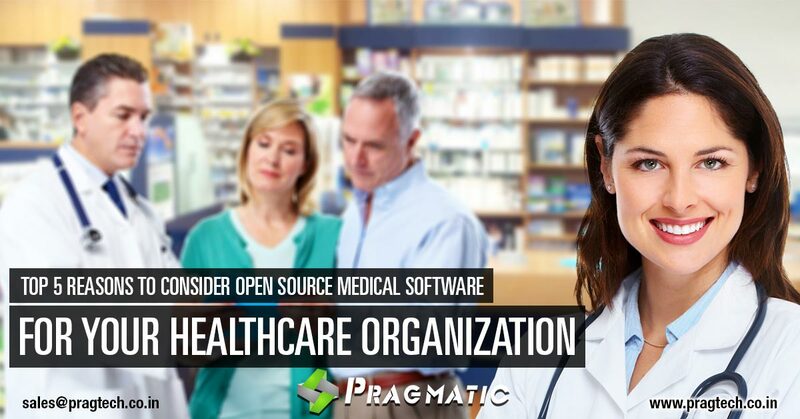 Open source medical software lets healthcare organizations use proprietary solutions where needed and supplement that technology with flexible open source software. This is why carefully considering and planning the future of their IT infrastructure is so important. Proprietary and open source technologies work together because having access to the source code allows the developer to adjust the open source solution to be compatible with a proprietary solution. Many proprietary vendors understand this type of hybrid infrastructure and develop their products to be able to interoperate with open source medical software. Providers need to adopt open source medical software in a way that allows the organization to build on it and take advantage of future technology as well as maintain legacy solutions that don’t need to be urgently replaced. 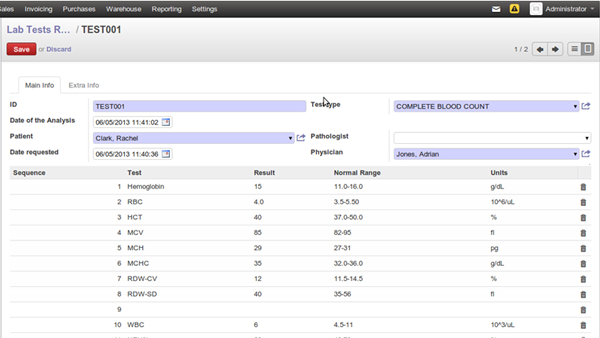 Open source medical software also gives healthcare organizations more complete control over their IT infrastructure. They have more knowledge as a purchaser than they would if they were buying a proprietary solution. Healthcare organizations benefit greatly from having elevated control over their IT infrastructure solutions because they can build a flexible IT infrastructure around what they currently have in their infrastructure and what they hope to implement in the future. Purchasers would be in a stronger position if they inspect, and allow others to inspect, the quality of their code. If they ensure that the programming code will be easily maintainable and that the data are stored in an established open format so that it will be cheap to get the data out and switch software when needed; and, finally, if they acquire the rights to the code, including the right to take it to another programmer or software company. In general, then, purchasers will be in a stronger position when they buy open source medical software rather than proprietary software. What More an Open Source Medical Software can Offer? Open-source medical software offers the same benefits in medicine as it does in other fields. These include ethical advantages, access, innovation, cost, interoperability, integration and safety. As medical software begins to offer decision support, risk management, performance rating, and analytic features, physicians should not accept black boxes and secret formulas that constrain sharing and intimately affect patient care and remuneration. Open source medical software reduces disparities because it is, almost without exception, free and accessible to all, domestically and around the world. Open source medical software can be easily developed, adapted, and used anywhere, much as books and research papers are today, and the fiscal benefit to both developed and developing nations is obvious. In our globally interconnected world, the dissemination of medical knowledge and best practices could be even more important than the low cost. 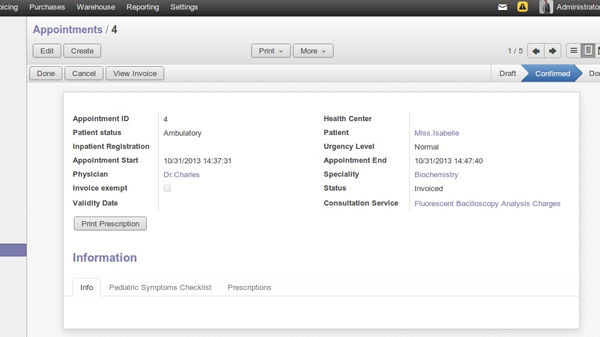 Open source medical software such as Odoo for Healthcare are widely used to run major public health initiatives concerning HIV/AIDS, tuberculosis, and malaria. Open source medical software promotes innovation in the same way that publication of research and methods does. It can be combined and extended in the same way that research can, which is a major reason why, once it is established in a field, it is difficult to surpass in terms of features and performance. The Firefox and Google Chrome web browsers are examples of open-source software that has come to dominate a major category. Anyone who remembers the days when cell phone numbers were tied to carriers knows the meaning of lock-in. 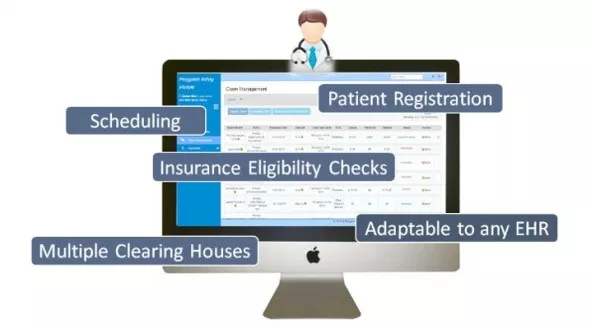 Changing from one proprietary electronic health record to another is expensive and disruptive and often results in information loss. Proprietary software is designed to make migration difficult. By making the cost of switching high, vendors can charge more for upgrades and support than they could if switching were easy or inexpensive. Open source medical software vendors have no incentive to lock in users and, even if they did, they would be unable to prevent a service provider from altering the software to eliminate this design feature. The vendor lock-in business model also works against the adoption of standards. Common terminology and effective communication, essential to medical science and public health, depend on standardization. The Framingham Study, for example, would have significantly less impact if every participating lab measured the cholesterol of its patients in a proprietary way. As physician’s income becomes increasingly tied to patient outcomes and dependent on coordination of care, lack of interoperability, integration, and standardization has begun to impact clinical practice. It is hardly surprising that interoperability and integration costs related to proprietary health care software are extremely high and that the true value of health care services is difficult to measure and compare. Standardization can undermine a proprietary software vendor’s ability to control the customer by making it easy to transfer essential information to another system. Standardization costs proprietary software vendors twice: first, in direct cost when they have to write the software according to somebody else’s specifications (the standard), and second, in opportunity cost, when it reduces the price they can charge for upgrades lest the customer switch to a competitor. Web browsers once again offer an example, as we recall the days before open-source browsers when some web sites and applications would only work in Internet Explorer. Because proprietary vendors will drag their feet on standardization, physicians, as ethical professionals, must insist on open source medical software to drive standardization that will allow objective comparison of treatment alternatives. Ongoing support for a medical device or service is clearly critical to effective practice. Proprietary software puts the physician at the mercy of the vendor, who is often more interested in acquiring new customers than serving locked-in customers. Open source medical software, by definition, allows users to choose their support service provider. Unlike proprietary vendors, Open source medical software support providers have to compete for the user’s business. Open source medical software also benefits from free community support. The broad ability of users to adopt and improve software creates diverse, global communities on the Internet with significant incentive to help each other. Finally, an open source medical software excels where proprietary software cannot in bug fixing and patient safety. Open source medical software communities have a strong incentive to publicize bugs—if only because they are a waste of time—and sophisticated users can fix the bugs themselves. Even more important, Open source medical software is not forced to reinvent code that has already been developed by others. The quality of proprietary software suffers greatly from the secrecy of its internal workings. Unlike a medical device or service that is subject to inspection and incremental refinement, new proprietary software from a given vendor is likely to include many of the errors and patient safety problems that other vendors have solved. Open source medical software, on the other hand, mirrors typical medical research practice by reusing proven code and promoting transparency with equivalent benefits of patient safety. For all the reasons above, medicine stands to benefit as much or more from adoption of Open source medical software than other professions and applications or proprietary software. The penetration of open source medical software in electronic health records will increase as the market segment matures and ethical advantages, interoperability, and patient safety become key differentiating factors.